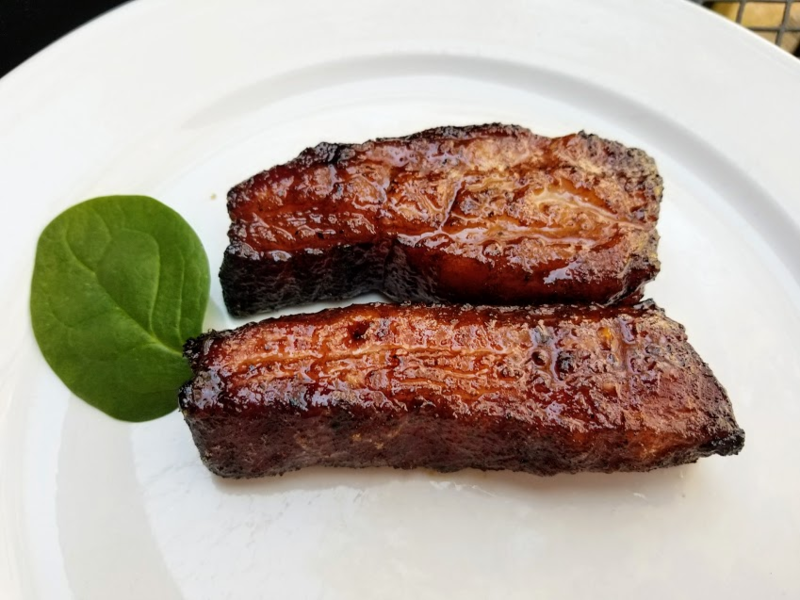 After reading an article by a friend about his boss smoking a pork belly, I decided to give it a try. I have smoked just about every kind of meat there is but somehow, pork belly has evaded my culinary attentions. So as I was out an about doing my routine shopping, a light from heaven struck me down in the meat aisle and the most beautifully, perfect cuts of pork belly appeared before me. I didn’t feel worthy to even cast my mortal eyes upon such beauty, but my growling stomach took over and seized the meat like Golum grabbing his Precious! Once I had this glorious meat procured, I gently placed in the back seat of my SUV and secured it with the safety belt just in case. In the event of a debilitating collision, I wanted to ensure that once out of the hospital I would be able to enjoy smoking this pork belly in my full body cast. Once home, I bolted from the car like a kid who was late for Saturday morning cartoons to the kitchen with my mesmerizing trophy in hand! I then realized I had abandoned the rest of my spoils and and to impatiently retreat to the car and gather the rest of the groceries. After putting up all the groceries, I turned my predatory eye to my prize! I retrieved my trusty metal pan and began inspecting all of my spices and concoctions, my mind reeling from the possible combinations and flavors I could conjure to bestow upon this beautiful piece of meat. 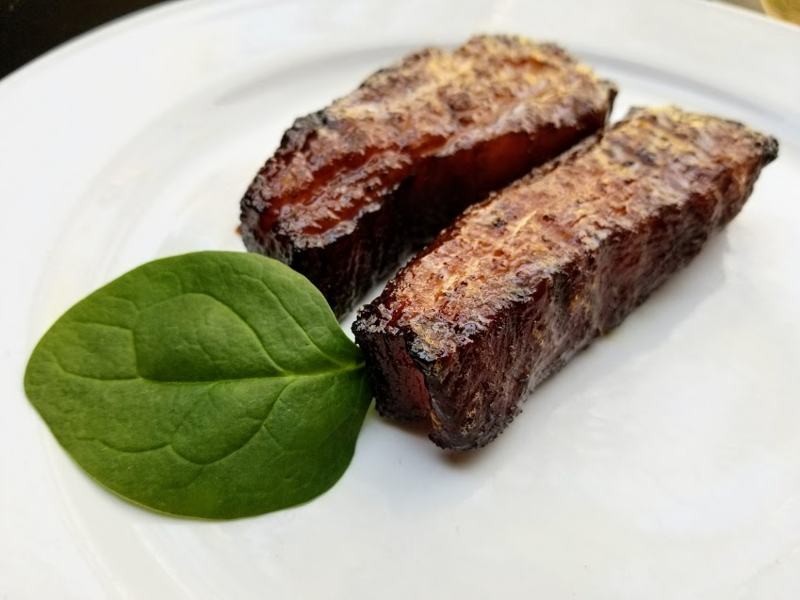 I settled for simplicity in order to allow the mouthwatering flavor of the pork belly to be featured above all other flavors. I selected a basic seasoning salt and Everglades Seasoning. I usually only use the Everglades Seasoning on vegetables and pork so I was fairly confident it would compliment this godly cut of meat. I mixed the two spices and applied a thick dry rub to two pieces of the pork belly. I covered it and let it set while I prepared the grill. I absolutely detest gas grills and will only grace the presence of a charcoal cooker. On top of that, in my opinion, any person who uses lighter fluid or pre-soaked, easy light charcoal briquettes are mere mortals and not worthy to approach the holy alter of a grill! (Getting off soap box now..lol). But seriously, cook with what you’re comfortable with. My grill is a simple barrel shaped grill with a small barrel attached to the left side for indirect heating and smoking. I use a chimney style starter for my charcoal and use paper as a fuel to get the coal going. Once the coal is glowing red with white edges, I place it in the side box of my grill and allow the temperature of the grill to get to about 400 degrees. At this point the alter is ready for its worthy sacrifice and I, with much pomp and circumstance, present the seasoned meat to the grill. Immediately the grill acknowledges the worthiness and approval of my offering by hissing and spitting like a beast born of fire. I sear each side of the pork bellies and then lower the temperature to begin a low-and-slow smoke of this meal. I add a stick of hardwood on the coals to start the smoking process. 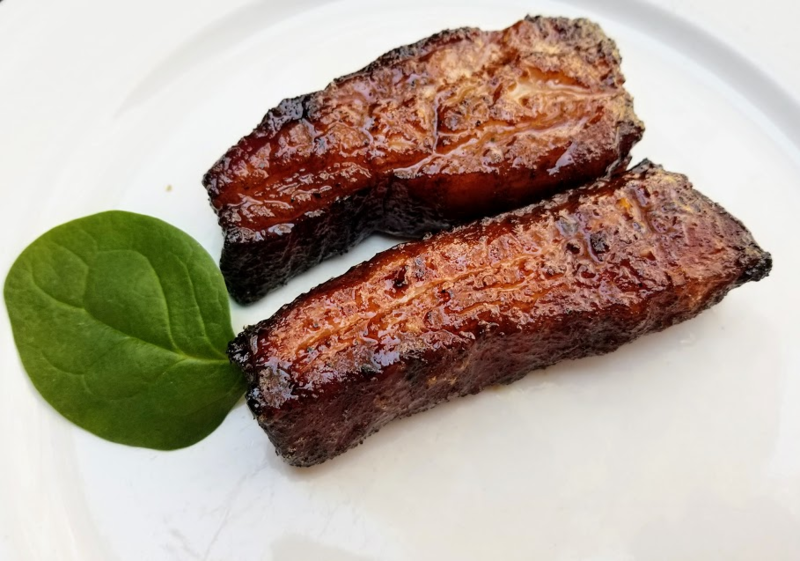 About every hour or so, I open the grill and pour maple syrup through a basting brush hovering above the pork belly and as it drizzles on each side, I use the brush to smooth it over the now bronzing sides of the meat. For each coating, I rotate the bellies to ensure an even coating and cooking. Once all the sides are glazed, the bellies are left fat side up to allow the fat to render and permeate every ounce of the rest of the belly. As the process is completed, I remove the bellies from the grill and cover them with tin foil to rest. I would suggest leaving them for approximately 15 minutes. I know this seems like a long and arduous process but the first bite will send you into a rapturous stupor that few mortals ever experience and you will gladly sacrifice any amount of time to repeat this pleasure. The pictures are of the finished product and I was absolutely drooling on the counter trying to take these shots before attacking them like a starving lion on the savanna! I hope you enjoyed reading and happy cooking! This article originally published on Steemit. It was republished here with the author’s permission.